1. ANNUAL PERCENTAGE RATE (APR) This term reflects the cost of all credit and finances as determined by the length of a year, including the interest rate, points, broker fees, and other credit charges obligated to the buyer. payment in an attempt to protect the lender from possible default. advise no less than 10 to 15 percent. However, with the economy still weary and lenders still stringent, any amount over 20 percent of the purchase price is recommended, and is often required to avoid having to pay for private mortgage insurance. 4. CLOSING COSTS Closing Costs also maybe referred to as transaction costs or settlement costs and may include various fees and charges associated with finalization. These may include or be related to application fees, title examination, title insurance, property fees, as well as settlement documents and attorney charges. 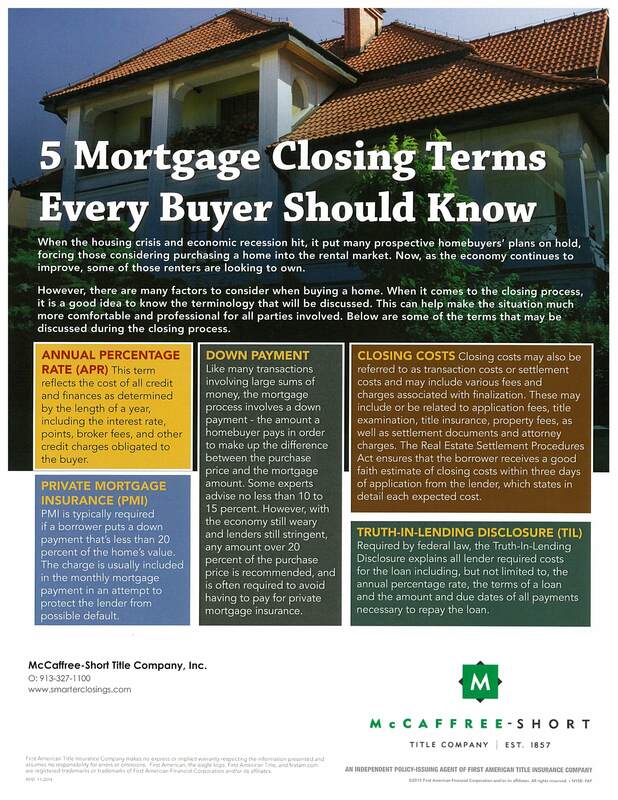 The Real Estate Settlement Procedures Act ensures that the borrower receives a good faith estimate of closing costs within three days of application from the lender, which states in detail each expected cost. and the amount and due dates of all payments necessary to repay the loan.